It’s been nearly 20 years now since the Parasyte manga ended and despite its lasting popularity, it never received an anime adaptation—until now that is. The plot of Parasyte is as follows: One night, spores fall across Japan. Inside the spores are small parasitic creatures that dig into the first human they find, make their way to the head and consume it—effectively taking over the body. However, in the case of young high schooler Shinichi, he is able to keep the creature trapped in his hand by using his headphones as a makeshift tourniquet. 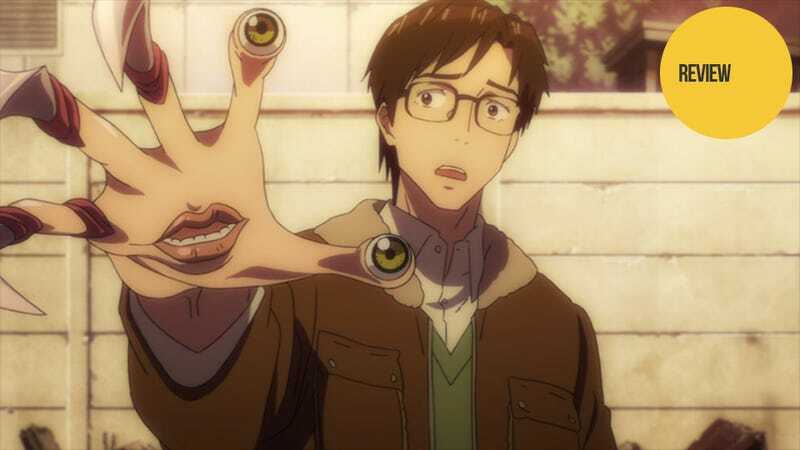 So instead of taking over his body, the Parasyte, “Migi,” takes over just Shinichi’s hand. Soon, the two find themselves as unlikely allies as the other Parasytes are sure to kill any human who knows about their existence—even if that human has a Parasyte for a hand. Migi and Shinichi could not be more different at the start of the anime. Shinichi is a shy, emotional teenager. Migi, on the other hand, is a being of pure, brutal logic. While Migi is willing to live alongside Shinichi, he will also respond to any threat to his life with brutal efficiency. Thus, Shinichi is unable to tell anyone what has happened, lest Migi murder them. Still, Shinichi sees himself as the only person capable of standing against the other Parasytes and continuously tries to get Migi’s aid in foiling their plans—despite the danger to himself and the terror this causes him. Of course, his meddling with the Parasytes’ plans often turns out badly for those around him. As the series continues on, Shinichi finds himself becoming more and more cold and logical—likely in part due to Migi’s influence on his biology and in part as an emotional defense mechanism against the rising body count. This new outlook on the world causes Shinichi to suffer an existential crisis. Is he still human? What does it actually mean to be human? If he is not human, is he a monster? And what exactly is a “monster”? What’s great is that there are no easy answers to these questions and that, over the course of the series, Shinichi has different answers to each one as he grows as a person. When it comes down to it, he is a child of two worlds—and forced to try to exist in both. The more time he spends in the world of brutally violent Parastyte battles, the more like the Parasytes he becomes. However, each time he is about to go too far, one of his personal connections—often his girlfriend Satomi—pulls him emotionally back into the human world and the internal conflict begins again. While the humans see the Parasytes as monsters, they see themselves as something far different. Sure, the Parasytes kill humans for food. However, as logical beings, they find nothing morally wrong with this; they just believe they have replaced mankind at the top of the food chain and thus have a biological imperative to survive. And with the ability to move in the blink of a human eye and turn their limbs to blades of steel, they can kill a human with ease. The thing is, as strong as the Parasytes are on an individual basis, they are quite weak as a society—especially when juxtaposed with humanity. The Parasytes don’t even know their own origin—whether they originated on Earth or another world is as much of a mystery to them as it is to the humans. Because of this, they have no real objective other than to survive. Of course, their best means for survival changes constantly as events unfold. At first, the Parasytes are content just living. They hunt in secret and try to live their hosts’ lives to some extent. But as more and more “murders” occur, they grow ever closer to being exposed. Soon the Parasytes have to look for new, smarter ways to stay hidden—like running for public office in hopes of using human means to alter this human environment into a safer hunting ground. Watching the Parasyte society evolve and clash both internally and externally is just as interesting as the physical battles Shinichi and Migi are drawn into. The story of Parasyte was first told in manga form from 1988 to 1995 and was set in that era. The anime, however, is set in the modern day. This means the story has been subtly updated to include everything from tablets and computers to the internet as we know it today. While for the most part this is handled well, the original manga was set in a time before the widespread use of cell phones. In the modern day where everyone carries a phone that doubles as a computer, video camera, camera, and instant messenger, people are generally far easier to contact than they were in the 80s and 90s. Thus, some of the plot points that revolve around one character or another being “out of contact” feel a bit out of place. However, this is a minor nitpick in what is otherwise an excellent anime. Parasyte has long been a critically acclaimed manga classic, so it’s more than a little surprising that it took so many years to receive an anime adaptation. However, with compelling character development; excellent exploration of the themes of humanity, monsters, and our place in the natural world; and exciting action that propels the character development and theme exploration forward, Parasyte has proven to be worth the wait. Parasyte -the maxim- aired on NTV in Japan and can be viewed for free and with English subtitles in the US at Crunchyroll and Hulu.